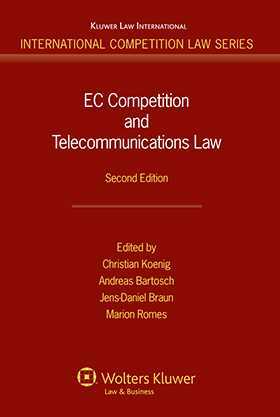 This new volume updates the groundbreaking analysis of its first edition in 2002, when the EC common regulatory framework for electronic communications networks and services had just entered into force. So much has changed in the intervening years that that this new edition bears little resemblance to its predecessor, with every chapter either extensively altered or entirely new. It remains, however, the most detailed and comprehensive overview available of the application of the EC Treaty’s competition rules in the markets for telecommunications and audiovisual media, and of the applicable regulatory framework. Relevant EC media and communications law and relevant aspects of EC competition law are dealt with in detail. While some chapters focus on competition law, others deal primarily with sector-specific regulation. There is practical guidance throughout on procedural matters, alongside analysis of the substantive provisions. Well-known in its first edition, this thoroughly revised and updated version continue to be vital reading for practitioners, in particular those specializing in European competition law and for company and in-house lawyers who are seeking advice on how European law affects their business. As a detailed analysis of the basic legislative and regulatory framework of European telecommunications law, it will be an invaluable reference work for lawyers, judges, regulators, and policymakers in all the EC Member States, as well as for students and teachers of European law. 1. The International Regulatory Framework of EC Telecommunications Law: The Law of the WTO and the ITU as a Yardstick for EC Law; C. Koenig, J.-D. Braun. 2. The Emergence of EC Telecommunications Law as a Self-Standing Field within Community Law; J.-D. Braun, R. Capito. 3. The Liberalization of European Telecommunications and Broadcasting Markets: The Road from Monopolies to Competition and Universal Service; R.J. Klotz, A. Bartosch. 4. The Applications of Article 81 EC and Article 82 EC in the Telecommunications Sector; R.J. Klotz. 5. State Aid; L. Papadias. 6. The Application of the EC Merger Control Regulation in the Markets for Telecommunications and Internet-related Services; M. Rosenthal. 7. The Framework Directive; J.-D. Braun, R. Capito. 8. The Determination of Markets Justifying Sector-Specific Regulation: The Article 7 Procedure; Grewe. 9. The Framework for Network Access and Interconnection; Winkler, Baumgarten. 10. Authorizations; Brandenberg. 11. Data Protection and Privacy; Schnabel. 12. The EC Regulatory Framework for the Administration of Scarce and Finite Resources; Nacimiento. 13. Mobile Telephony; Obst.